Deputy Prime Minister Julia Gillard has rejected a push for a big cut in Australia's migration intake (20 February 2009), despite "Research from Monash University demographer Bob Birrell [which] says the Government's economic rescue package will not save jobs unless the migration intake is cut by two-thirds." The ABC describes Ms Gillard as having rejected the research, saying there is still a need for skilled migrants. "We've made some recent changes so that we are taking skilled migrants who have jobs," she claimed, insisting that, "(...) even in today's economic circumstances there are still some parts of our nation where people are crying out for skilled labour, and we have the migration system to assist with that." 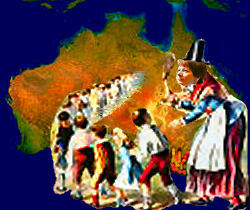 Let's see, Gillard believes that there are still some parts of the nation that desperately need skilled labour. Maybe so, but do they "still" need (as if they ever really did), an imported labor force and all its family members coming in annually at a higher rate than ever before, equivalent to the population of a small, rapidly growing city each year? And what do we do with the newly unemployed when these immigrant-demanding businesses go bust? I'm afraid that Ms Gillard sounds to me as if she is more interested in satisfying the demands of the property development and finance industry (which have driven our economy and democracy into the ground) than in serving her constituents (the broad population of Australia) and looking after our long-term welfare. As candobetter commentator, Greg Wood, rails, "Can someone get Gillard to specify where the skills shortage is now that the resources industry and construction industry are beginning to majorly shed jobs? Who pays for this costly habit? While they are at it, can they also ask how increasingly unemployed and under-employed Australians are going to pay the pressure-cooked urban rentals that her lackey Government seems intent upon trying to prop up?" Meanwhile, a key employer group says the research recommendations amount to a form of protectionism. "The skilled program... can't be turned off and on," Australian Industry Group (Ai Group) chief executive Heather Ridout told ABC Television. The government needed to be very careful about "chopping" immigration numbers, she said, adding that employers were committed to current intake. "If we do not keep the immigration scheme robust our economic growth potential will be much reduced." Is Heather Ridout really suggesting that we should simply allow the free flow of foreign labour into Australia with no concern whatsoever for the economic wellbeing of our existing citizenry? Oh, and as for employers being committed to a high intake, well duh! Of course they are committed to the ongoing importation of cheap labour and more consumers. However, last time I checked, we weren't meant to be running an immigration program for the sole benefit of employers. Rubbish. Economic growth means increasing the amount of capital per head of the population. Immigration does nothing to aid this process. Britain moves to cut immigration. Why not Australia? "Work permits for migrants to be cut"
No doubt the British Government's attempt to put its own citizens first will also be viewed as an example of "protectionism" by Heather Ridout. It will be very interesting to see how this plays out in the near future! The government are going to be on thinner and thinner ice with this as unemployment rises. It's hard to see how they will be able to continue to justify to the public the continuation of the high immigration rate. But I'm sure they'll try. Their true motives will be exposed for all to see - bring it on! If Australia maintains its current regime of high immigration numbers during a recessionary period touted as the worst in the post-war era, it will simply prove beyond doubt that Australia's immigration program has become divorced from serving the real needs of Australia and Australians. It is immigration for immigration's sake; to property speculators happy by ensuring steady and ever increasing demand for housing; to keep wages down and party contributions from the business community up; to pander to ethnic voting blocs and satisfy their neo-colonial aspirations by assuring them that the influx of their countrymen will continue unabated, further cementing their permanence, prevalence, and eventual dominance in Australian society. In the end, of course, it is Australians who will end losing the most - their jobs, their prosperity, their chance at affordable home ownership, their quality of life, their natural environment, their culture and national identity, and even, eventually, their country itself. I commend Sheila's prompt response to the disturbing news that our Government is resolve to maintain not just high immigration, but levels of immigration jacked up only in May last year beyond what were already beyond the record high immigration levels so deceitfully imposed on this country by the former Howard Government. However, I have one slight bone of contention with this article, that is, the use of the word 'addicted' in the title. To me the word 'addicted' has the effect of diminishing the moral culpability of Gillard and the rest of her Government for a cynical calculated betrayal of the wellbeing of the country as a whole and, particularly, those who voted her into Government. Given the overwhelming opposition to high immigration,this Government would face no political difficult whatsoever if ti were to immediately and drastically reduce the immigration intake. Of course it would face indignant outcries form the likes of Ridotu and the Murdoch newspaper, but such a storm should be on this Government could very easily weather. In the past political leaders with backbone and the true welfare of their countrymen and countrywomen at hear have shown themselves capable of defying the narrow selfish sectional greedy interests of their country's wealth elites. One who comes to mind is President of the United States Frankln D Roosevelt. Why should we expect any less of our own political leaders? If they are not up to the task, then we must make them step aside in favour of others who are.